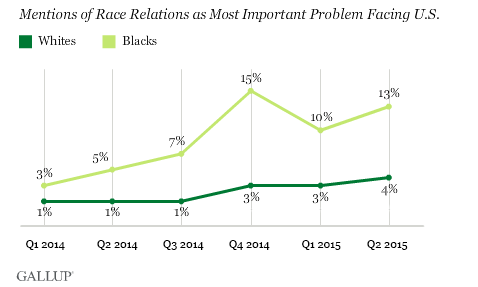 WASHINGTON, D.C. -- Black Americans' mentions of race relations as the most important problem facing the U.S. reached 15% in the last quarter of 2014, up from 3% at the beginning of that year. Mentions have remained relatively high since, averaging 13% in the most recent quarter, from April to June 2015. Since early 2014, white Americans' mentions of race relations as a top problem have increased only slightly, from 1% to 4%. The nine-percentage-point gap in the latest quarter between blacks' and whites' mentions of race relations as the top U.S. problem is significantly wider than the narrow gap of no more than four points in any year from 2002 to 2007. A number of high-profile police incidents of unarmed black men in 2014 and 2015 sparked protests across the country and elevated discussion of race relations. Three of the more highly publicized deaths involved Michael Brown in Ferguson, Missouri; Freddie Gray in Baltimore; and Eric Garner in Staten Island, New York. These findings are based on six quarters of Gallup's monthly measurement of the "most important problem" question from January 2014 through June 2015. Overall, Americans' mentions of race relations as a top problem increased from 1% in the first quarter of 2014 to 5% in the fourth quarter of 2014, including a reading of 13% in December, and have remained in the 4% to 5% range in 2015. While race relations has risen as a top issue since early 2014, dissatisfaction with government, the economy and unemployment still dominate Americans' list of the most important problems facing the country. The top problems that blacks saw facing the country in the latest quarter were race relations (13%) and unemployment (13%), while whites most often cited dissatisfaction government (18%) and the economy in general (12%). Blacks have consistently been more likely than whites to perceive unemployment as a top problem, a pattern Gallup has previously documented. This pattern may reflect real-world differences in unemployment among the groups. The unemployment rate was 10.2% among blacks in May 2015, more than double the 4.7% of whites who were unemployed, according to the U.S. Bureau of Labor Statistics. Other issues that are more glaring for blacks than for whites are crime and violence as well as poverty, homelessness and hunger. The latter may reflect that blacks have lower average incomes than whites and are more likely to be living in poverty. This is also consistent with a Gallup and Healthways finding that blacks are twice as likely as whites to report having struggled to afford food at least once in the previous 12 months. Whites are more concerned about the federal budget deficit and debt as well as terrorism, while both groups are equally likely to cite healthcare and education as top problems. After the highly publicized outcry in Ferguson after Brown's death, blacks became just as likely to name race relations as the nation's top problem as they were to name unemployment. And this level of concern has held following riots in Baltimore stemming from Gray's death after Gray was taken into police custody. Whites' mentions of race relations as a top problem did climb slightly over the same time period, but not nearly as much as among blacks. Just as blacks and whites differ in their views of race relations as a top U.S. problem, they also stand apart in their views on the fairness of the criminal justice system, confidence in police and the need for new civil rights laws. Gallup found last June that 68% of blacks said the American criminal justice system is biased against black people, significantly higher than the 25% of whites who said the same. And while 37% of blacks said they had a "great deal" or "quite a lot" of confidence in the police, 59% of whites said the same. Gallup has also found that blacks are much more likely than whites to say new civil rights laws are needed and that the government should be actively involved in improving minorities' economic and social status. Blacks' elevated views of race relations as a top problem in the U.S. may persist in the months ahead, after the release of a highly publicized video last week of a white police officer shoving a black teenager in a bikini to the ground in McKinney, Texas. Results for this Gallup poll are based on telephone interviews conducted April-June 2015, with a random sample of 3,566 adults, aged 18 and older, living in all 50 U.S. states and the District of Columbia. For results based on the total sample of national adults, the margin of sampling error is ±2 percentage points at the 95% confidence level. For results based on the total sample of 2,698 non-Hispanic whites, the margin of sampling error is ±2 percentage points at the 95% confidence level. For results based on the total sample of 352 non-Hispanic blacks, the margin of sampling error is ±7 percentage points at the 95% confidence level. Americans' confidence in the government's ability to protect citizens from terror attacks is the lowest in Gallup's 15-year trend. The 49% worried about personally becoming a victim of terrorism is among the highest since February 2003.